Jesus did it, how about you? Are you willing to be seen with those who are “sinners?” What’s interesting to note about this passage from Scripture is that EVERYONE is a sinner. Therefore, the truth is that everyone Jesus associated with was a sinner. But this passage and criticism of Jesus was not so much about Him associating with people who had committed sins; rather, it was more about Him associating with those who were looked down upon by the elite of society. Jesus freely spent time with the “undesirables.” He was not afraid to be seen with those who were scorned by others. The scribes and Pharisees were very quick to notice that Jesus and His disciples welcomed these people. 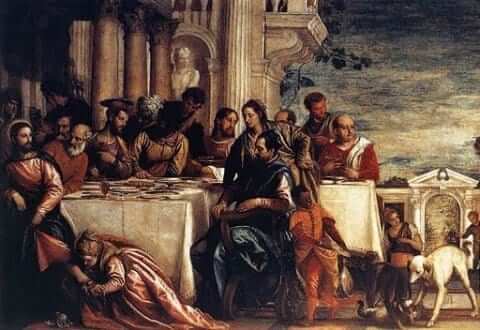 They ate and drank with tax collectors, sexual sinners, thieves and the like. More than that, they apparently welcomed these people without judgment. So back to the initial question…Are you willing to be seen with and associate with those who are unpopular, dysfunctional, hurting, confused, and the like? Are you willing to let your reputation suffer because you love and care for those in need? Are you even willing to go so far as to befriend someone who will damage your social reputation? Reflect, today, upon the person in your life that you may feel like shunning. Why is that? Who is it that you may not want to be seen with or who you may not readily want to associate with? It may be the case that this person, more than any other, is the person that Jesus wants you to spend time with. Lord, You love all people with a deep and perfect love. You came, especially, for those whose lives were broken and sinful. Help me to always seek out those who are in need and to love all people with an unwavering and non-judgmental love. Jesus, I trust in You.